Starting off with a hard one, huh? 3 great men; it's tough to choose. I'm going to go with George Washington. No, wait! Abraham Lincoln. No, wait! Thomas Jefferson. I don't think I can choose just one! All 3 of them have very intriguing histories. It does seem that maybe Lincoln was more loyal to his wife. You don't hear about "Lincoln slept here...and here...and here" like Washington, and he didn't have offspring with women who weren't his wives like Jefferson did. This is a "local" chain, but right now I'd go with Smoky Mountain Brewery. They have $5 burger nights along with $3 beer on Wed., and every now and then I'll meet some friends to play trivia. Good times, good food! I hope that I will look back and say it was good: I married a wonderful man and had 3 boys with him. We've done some traveling (and hope to do more), and I chose a profession that helps people and, as an added bonus, I love. Grapefruit = EWWWWW! Give me an orange...a navel orange so I don't have to deal with the seeds, please. (yes, I realize that's just laziness!) Here's the weird thing: I love oranges, but don't care for orange juice, unless there's some apple juice mixed in with it. And definitely no pulp. Oh, gosh, Joyce! Again with the hard questions! I cleaned out YS' closet last July when he was at band camp. Does a pantry count? I cleaned that out last summer. I'm sure there are closets that need to be cleaned out, but they have doors so I'm not too concerned about it! Are we talking alive or does it matter? 'Cause I have some serious questions for the Virgin Mary. I'd also like to have Jesus at that same table, because then you KNOW I'd get some honest answers. And while we're at it, can't have Mary & Jesus without Joseph! I'd say a 5. Unless there's somebody waiting on me, then I'd go and find another parking place. Once I get in, the car probably won't be straight, but then again, I have a hard time parking straight in regular parking place! What a nice surprise that the hubster gave you! I know it made your day!! Very pretty charm for your bracelet. He done good!! Oh he did so good. I am impressed. Frank and I don't do Valentines Day...I sent him an ecard and he sent me one. We ate out last night....period. We will have to do that Brewery place next time I am up....on trivia night for sure. Aww...I'd say your hubby is definitely a keeper! I didnt realize George Washington had such a scandal as a lov-ah!!! Who knew??? I feel the same way about grapefruit! 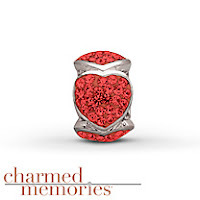 What a pretty charm ... and a sweet way to giving it to you. Our Valentine's Day evening wasn't very glamorous or exciting ... we stayed in, watched hockey and Westminster. Guess we're just a couple of old fogies! ha! I'm with you on oranges ... I don't know that for me it's laziness, I just hate eating an orange segment and biting into a seed. ...at least you'd attempt to park parallel. And being a '5' in your estimation sounds good enough to me. Better than my answer...by far. I never really thought about the fidelity of those men, but it is telling of their character...or was it society in their times? Hmmm, now I'm curious. Pretty charm for bracelet. Answer to #1 is so true. The best part of the gift was the way he presented it to you! That was awesome! I'm with you on the grapefruit- EWWWWW!!! I thought a few of the questions were hard this week. Joyce is the best at asking them! What a great gift. I have a Pandora one that could use a heart! Awww, your hubby is awesome. I'm glad you have someone so special in your life.